Although other manufacturers had offered retracting-nib safeties since just before the turn of the century  most notably, the straight-action Moore Non-Leakable  Waterman's entry into the market expanded the design's acceptance exponentially. Waterman announced their new safeties at the end of July of 1908. Initially they were offered in only three sizes (12VS, 14VS, 15VS, each in just one standard length) with the option of gold filled barrel bands and the choice of smooth or chased black hard rubber, or "Cardinal" red hard rubber. The 1908 Waterman catalog, published at the beginning of October, extended the offerings to include standard and short models, as well as silver filigree overlay. Early models had a threaded turning knob at the end of the barrel, onto which the cap could screw (a feature later copied by Kaweco in Germany) and a helically-cut track inside the barrel, so that the nib turned in relation to the barrel as it was extended and retracted. 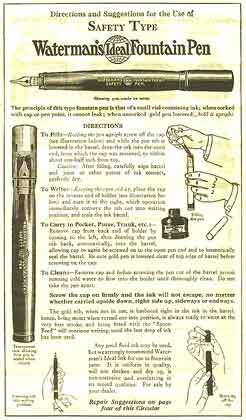 The threads appear to have been eliminated from the end knob somewhere between 1911 and 1912 (an ad from May 1911 still shows a threaded knob, as does the British December 1910 Pen Prophet; in the Fall 1912 Pen Prophet the threads are gone). At around the same time, the tracks inside the barrel were made straight, so that the nib traveled forward and back without turning, propelled by a helically slotted tube (usually termed a "spiral") attached to the turning knob. The original arrangement appears to have been adopted to circumvent Peck and O'Meara's US patent 523,234 of 1894, which would have expired in July of 1911 -- although it appears that Waterman secured the rights to this patent, along with several others, in a deal with Francis C. Brown of Caw's fame a year earlier. 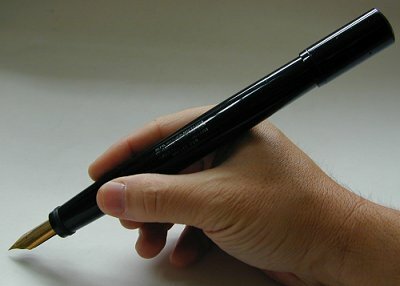 Although one finds pens with the earlier internal mechanism that have the later, unthreaded end knob, it is likely that in most such cases the end knob has been replaced. The earlier threaded knobs were easily chipped and broken, as the exposed flange was quite thin. When replacing the seal, the central shaft is driven out of the end knob with a punch. The flange supports the knob in this operation, receiving all the force of the hammer. The thicker, unthreaded flanges are quite sturdy, but with the threaded end knobs one can easily break off the entire flange with one light tap. Given the risk, we will not usually replace the seals on Waterman safeties with threaded knobs. By 1912, Waterman had introduced a range of new overlay patterns for its smaller models, including full overlays, telescoping caps, and chatelaine suspension hooks. The largest Waterman safety was the 20, carrying a huge #10 nib; the smallest was the safety version of the more common cone-cap "World's Smallest" miniature. Both are now rare and valuable. Repair of Waterman safeties is straightforward, and even easy now that properly-sized O-rings are available to replace the original cork seals. Full details on how it is done here. UPDATE: Recent research has pushed back the beginning of production of the helical-track safeties to May 1908, and has revealed that a straight-track design preceded it. This first design was made in very small numbers, as it was quickly withdrawn in response to the protests of the Modern Pen Company that it infringed the Peck and O'Meara patent, which they then owned. No surviving examples have been identified to date.